Former Ryder Cup player David Gilford is in the field for the Tartan Tour’s first big event of the new season in East Lothian next week. 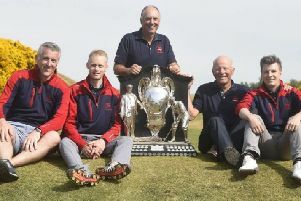 The Englishman, who faced the Americans in both 1991 and 1995, joins Scotland’s top PGA playing pros in the P&H Championship at The Renaissance Club. Also in the line-up for the 54-hole event, which starts on Monday, is former European Order of Merit winner Ronan Rafferty. Paul Robinson from Largs won the event when it was staged for the first time at the Dirleton venue last year. Stephen Gallacher’s son, Jack, helped Lothians U16s scrape a 6-6 draw with their Perth & Kinross counterparts in an annual match, played this year at the Glen. In the morning foursomes, the Kingsfield player and Kings Acre’s Rory Thain went down by one hole in the top match. But Gallacher bounced back with a superb 7&5 victory over Auchterarder’s Harry Clark in the singles. Jake Edgecombe (Baberton) also won his afternoon match for the home side. Jane Herd, the 2013 runner-up, went one better to become the new East Lothian Ladies’ champion. The Gullane Ladies player claimed the title with a hard-earned last-green win, having been one down after ten, over North Berwick’s Keren Ward in the final at Musselburgh. Played at the same venue, the Handicap Quaich was won by the host club’s Janette Laing, who also won by one hole against clubmate Anne Blundell. More than 600 players from 50 different countries are heading to East Lothian the week after next. They are flocking to Scotland’s Golf Coast for the latest edition of the US Kids Golf European Championship. The event, involving nine boys age groups and seven girl age groups, takes places over over Gullane No.3, Craigielaw, Longniddry, Luffness and the Glen from May 31-June 3. Both Nigeria and the UAE are represented on this occasion.